This is purely because I’m lazy and don’t want to Google it every time I need to do it. When prompted enter your root password and you should be logged into a MySQL command line. We have a few Redhat Enterprise Linux Servers (5.8 64-bit) that perform some nightly backups by copying a large amount of data via NFS to another RHEL server. Since upgrading these servers to RHEL 5.8 we’ve run into a problem where shortly after the NFS copy operation the client servers freeze. We are unable to ping, SSH or even use the console to access the server after the freeze. We are forced to power cycle them. This issue occurred only after upgrading to RHEL 5.8 and while using the new kernel that came with it (2.6.18-308.1.1.el5). We found reverting the kernel on the clients to 2.6.18-274.18.1.el5 solved the problem. A bug has been submitted here: https://bugzilla.redhat.com/show_bug.cgi?id=805660 and hopefully I’m correct in thinking it’s a kernel bug. We left our NFS server running the new 2.6.18-308.1.1.el5 kernel and it’s been fine. Posted in CentOS, Linux, Redhat Enterprise. We ran into the following problem after upgrading our servers (Windows 2003 through 2008 R2) to Symantec Endpoint Protection 12.1 RTM from Symantec Endpoint Protection 11. This application has failed to start because \System32\SYSFER.DLL was not found. Re-installing the application may fix this problem. If the error comes up during a RDP session you never get to the desktop. I’ve also had it come up when physically in front of a server. Fortunately if you’re physically in front of the server you can click ‘Ok’ on the error and then hit ‘CTRL+ALT+DEL’ and reboot the server. Typically you can get into the server right away after the reboot. I also had luck trying different accounts when trying to get into servers. If my account didn’t work the local admin account sometimes would. Remove the ‘Application and Device Control’ component from Symantec Endpoint Protection on each of our servers. I’ve gone to one of our servers having this problem, removed the ADC component from Symantec and rebooted the server. The error message has not re-appeared after about 1.5 hours. Update: Removing the ADC component from Symantec has resolved this issue for us. Posted in Symantec, Windows Server. Ever wanted to change that Windows Server 2008 R2 Standard install into a Enterprise or Datacenter install with out having to wipe and re-install the whole system? 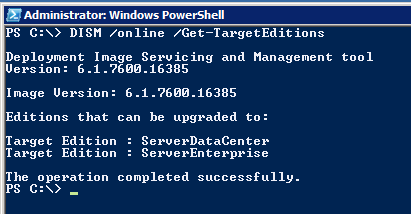 You can now do an in place edition upgrade with Windows Server 2008 R2. We have a Windows Server 2008 R2 Standard Edition Virtual Machine that we want to use as our KMS server. There are already some services deployed on this Virtual Machine so we’d like to avoid wiping and re-installing. I want to convert the Virtual Machine from Standard Edition to Datacenter Edition in place. Make sure you are absolutely sure you want to do this. Once you go up an edition you can’t go back down. So you can’t go from Standard to DataCenter change your mind and then go back to Standard. You would have to restore from backup, revert a snapshot if this is a VM or re-install the server. The server will reboot 2-3 times to complete the change. You might get an error when trying to use your companies MAK stating it’s invalid. If this happens you’ll want to use one of Microsoft’s Generic KMS keys for the edition your upgrading to and then once the upgrade is complete change the server over to your companies MAK. I’ve read you should attempt this on a Domain Controller. If you need to upgrade a Domain Controller it is recommended that you demote it first, upgrade the edition and then promote it.